Recently, I wrote about the good news that the United Nation’s International Court of Justice ordered a temporary halt to Japan’s annual slaughter of whales in the southern ocean after concluding that the hunts are not, as Japan claims, conducted for scientific research. The presiding judge, Peter Tomka, said Japan had failed to prove that its take of whales, mainly large quantities of minke whales in the Antarctic Ocean, was for scientific purposes. Unfortunately, this ruling has not served as the deterrent many hoped for. Japan’s Institute of Cetacean Research (ICR) says it plans to resume research whaling in the region next year, with a program that is “in accord” with the court’s ruling. Let us all hope this is legal wrangling on Japan’s part, as opposed to a real plan to resume whaling in the southern ocean. Either way, this news had me scrambling to locate some more encouraging news about the natural world. I found a new development that exceeded my greatest hopes and made my heart sing. Mr. Yan Shaohong, General Manager of Flower World, and Chinese bear bile farmer, asked for the assistance of AnimalsAsia to convert his bear bile farm in Nanning, China, into a sanctuary for its 130 bears. AnimalsAsia was founded in 1998 and is the only organization with a bear sanctuary in China. They have rescued more than 400 bears to date. From May 5, Animals Asia will take 28 of the sickest bears, 1,200km in a multi-vehicle convoy back to their existing sanctuary in Chengdu for urgent veterinary attention. Then Animals Asia will also take over the care of the bears on the Nanning bear farm and start the two-year process of turning it into a sanctuary. There are an estimated 12,000-20,000 bears confined to tiny cages throughout Asia, primarily in China, Malaysia and Thailand. These bears are victim to the barbaric practice of trade in bear parts, particularly gall, known as bear farming. They are confined so the bile can be extracted from their gall bladders and sold for use in Traditional Asian Medicine (TAM). The procedure is done with no anesthesia and causes intense pain to the bears, who are subjected to this several times over many years, or as long as they survive the horrid conditions. Major consumers of bile and other bear parts for TAM include China, Hong Kong, Japan, Philippines, Singapore, South Korea and Taiwan. Major suppliers of bear parts include Bangladesh, Bhutan, Cambodia, Canada, China, India, Indonesia, Japan, Laos, Malaysia, Myanmar, Nepal, North Korea, Sri Lanka, Thailand, United States and Vietnam. All eight species of bears are exploited for this international trade, including an annual estimated 40,000-80,000 bears from the United States. Bile is produced by the gallbladder and is composed of cholesterol, bile salts and bilirubin. There is nothing in bear bile that cannot be obtained through synthetic or plant based supplements. Mr. Yan Shaohong’s decision and well-publicized request for help in converting his farm into a sanctuary is proof that one person can make a difference. I do not know Chinese culture very well but I do understand peer pressure. To question any long held beliefs of TAM took an act of courage that would be critiqued on a national scale. Thank you, Mr. Yan Shaohong, for your courage and thank you, AnimalsAsia for everything you do to end bear bile farming. 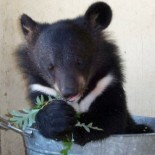 This entry was posted on May 2, 2014 by Maymie Higgins in Bears, Mammals, Maymie Higgins, The Ecotone Exchange, Wildlife and tagged AnimalsAsia, bear bile, bear sanctuary, Bears.